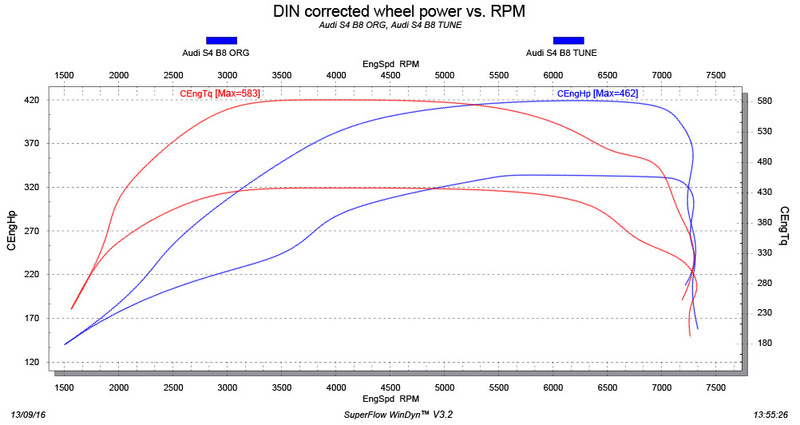 Home » Blog » Audi S4 B8 Tuning – Faster than the RS4? Apparently, it can be faster than the beastly RS4. The Audi S4 boasts a magnificent 3 l TFSI engine with six cylinders which produces 245 kW (333 hp) and 440 Nm (325 lb-ft) of torque. This makes it a serious driver’s car, especially if we have in mind the advanced Quattro AWD system. However, our engineers here at ZIP Tuning have given us three stages of Audi S4 B8 tuning resulting in 296 kW (402 hp) and 525 Nm (387 lb-ft) of torque, 318 kW (432 hp) and 550 Nm (406 lb-ft) of torque and 340 kW (462 hp) and 583 Nm (430 lb-ft) of torque, respectively, making it faster than even the stunning RS4 with a V8 engine. The Audi S4 is basically a smaller version of the revered S6. It has a powerful 3 l TFSI CAKA engine, producing 245 kW (333 hp) and 440 Nm (325 lb-ft), loads of comfort perks, AWD and more. The thing that makes it cheaper than the S6 is the fact that it is a smaller car, belonging to a lower class. However, when we talk about high performing cars, this might be a good thing. A bit less space on the inside also means smaller size on the outside and, more significantly, lower weight and this is far more important for a sports car. Let’s face it, people buying an Audi S are more into driving joy than comfort and there’s enough space on the driver’s seat anyway. This kind of power combined with the small sedan body means that the car can reach 62 mph in just 5 seconds and go all the way up to electronically limited 250 mph. And Audi is not the only company that sees the benefits of smaller performance sedans. BMW has produced the M3 with 313 kW (425 hp) and 550 Nm (406 lb-ft) which is more of a competitor for the more upscale RS4 with a V8 and 331 kW (450 hp). However, if you are more into Audi, or AWD, there is a way to enjoy more power than the M3 for far less money than the RS4 would set you back. Buy the S4 and tune it. For the S4 we have developed three thorough stages of the Audi S4 B8 tuning process that take the S4, the least powerful car of the three we have mentioned in this article, to becoming the most powerful one, surpassing even the V8 powered RS4 and leaving the M3 far behind. The Stage 1 alone brings the S4 a lot closer to the RS4 and M3 without adding any new parts. All of the changes are performed on the OEM ECU Simos 8.5 and they bring a seriously noticeable 49 kW (67 hp) and 85 Nm of (63 lb-ft) torque. The power upgrade for the Stage 1 is a three-part process. The first and the most effective one is increasing the air pressure. The increased pressure means that the engine gets more air to burn, thus releasing more energy and increasing the power. In order to burn all that air, there needs to be more petrol in the combustion chambers as well. This is why another tweak to the Simos 8.5 ECU was needed, this time to adjust the air-fuel ratio. The increased amounts of air and fuel brings about the next tuning step – changing the ignition time. The ignition is moved to an earlier stage of a stroke which ensures better combustion, resulting in more power and better fuel efficiency. However, there is an additional perk that is based on changing the ignition time. The perk is noticeably improved throttle response which adds a lot to the feeling that the increased power rating provides. 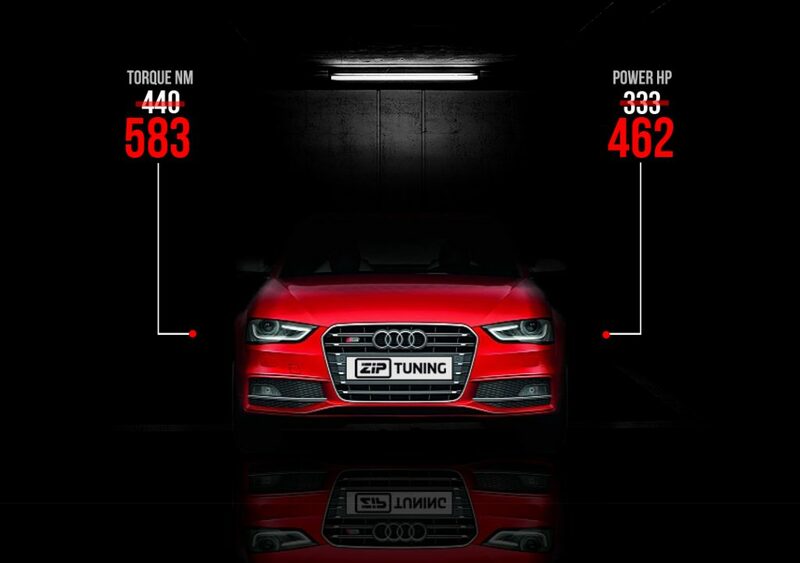 These three steps result in 296 kW (402 hp) and 525 Nm (387 lb-ft) of torque. Having in mind its size and all-wheel drive, the S4’s acceleration gets dangerously close to the RS4’s, threatening the beastly M3. 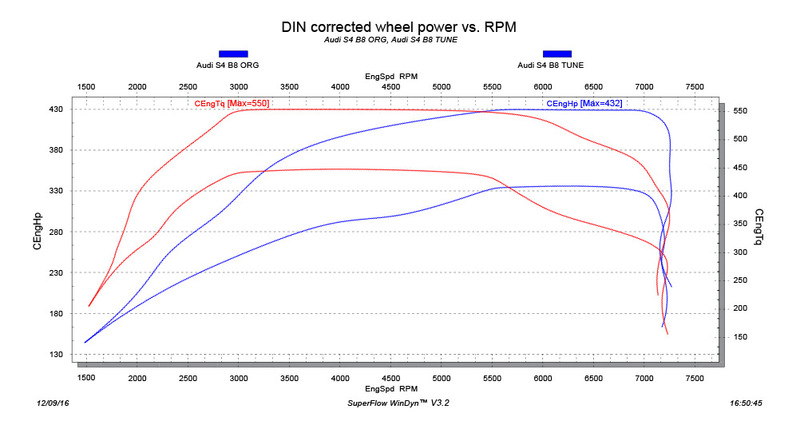 This is where the Stage 1 Audi S4 B8 tuning power upgrade ends, but there’s one more thing to do. The stock car reaches 250 mph, but even without any changes, it is capable of more, being electronically limited to the mentioned speed. Well, the top speed limiter is removed allowing the driver to enjoy the full potential of the new power rating. The ZIP Tuning Stage 2 Audi S4 B8 tuning introduces several new performance-oriented parts. These are aftermarket units used to improve intake and exhaust. The cold air intake comes from APR, while the exhaust can be either by Milltek, Super Sprint or Armytrix. When opting for these parts you can choose between cat-back (from the catalyst onwards) and save some money, or a full system. After these parts are installed, the software is adjusted again, so that the new parts can perform smoothly. The result is 318 kW (432 hp) and 550 Nm (406 lb-ft) of torque which leaves the BMW M3 behind. Let’s see what we can do when it comes to beating the beastly RS4. The ZIP Tuning Stage 3 Audi S4 B8 tuning adds just one part, but it is sufficient because the cheaper Audi S4 becomes faster than the flagship model of its size, the RS4. 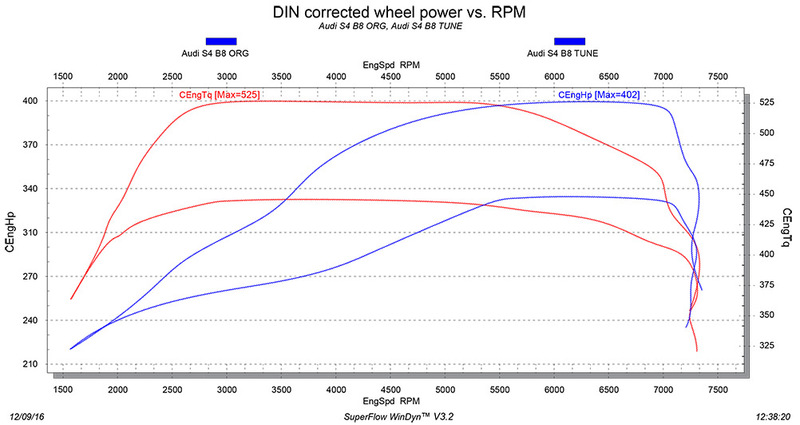 The power gain which results in 340 kW (462 hp) and 583 Nm (430 lb-ft) of torque comes from a new pulley supplied by APR. The result is almost 40% more power compared to the original car. The 95 kW (129 hp) of newly acquired power makes the Audi S4 significantly faster and altogether a more serious car in terms of performance. Add to this the improved throttle response from the Stage 1 and driving the ZIP Tuning Audi S4 becomes a whole new experience. If you liked our tuning stages project for the Audi S4 B8, you should know that we have so much more to offer. We have tuning projects for a large number of models, as well as many other tuning services. If you are a tuner, register on our professionals portal and start enjoying our services.